Another critical aspect of the recent court ruling is that ISPs can demand compensation for handling notices of infringement. The recent Canada Supreme Court decision could have wide-ranging implication for the future of file-sharing lawsuits. Much of the focus of the ruling revolves around the fact that the court ruled that an IP address is not indicative of guilt. While this aspect of the ruling is significant and cannot be understated, another aspect of the ruling is also significant. In fact, a case can be made that the Supreme court ruling is actually a double blow for those hoping to bring mass litigation against file-sharers and turn it into a business model. The other aspect revolves around compensation. More specifically, can ISPs demand compensation for handling notices of infringement? This is one of the many controversial aspects of mass litigation. Essentially, agents working on behalf of major corporate interests file notices of infringement against alleged subscribers. It could be a couple to a few thousand notices. An ISP, in turn, has to look up subscriber information, scan their networks and log information, then forward that information onto the subscriber as per Canada’s current notice-and-notice system. Keep in mind that many subscribers use a dynamic IP address because this is a default setting. So, not only does the ISP have to figure out who has what IP address, but also at what time on top of it all. As you can imagine, things can get quite complicated very quickly. Now, a perfectly legitimate question is, who handles all of this? In cases of accusations of infringement, the ISP typically handles all that work. They need someone who is trained to look this information up, know the privacy laws well enough, and do all of that work. That, of course, takes not only time, but money as well. Major corporate interests making the accusations argue that ISPs should simply eat the costs because that’s the cost of doing business. Some ISPs, in turn, can argue that this is an added cost being brought up by not only another company, but also a completely different industry altogether. After all, ISPs are not the major record labels personal police force. We’ve seen these types of policy arguments back in 2004 and 2005 during the original file-sharing lawsuits in Canada. It seems this topic is once again being brought up. 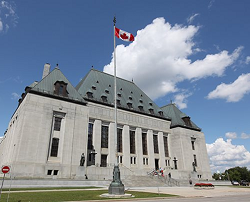 The question of costs lies at the heart of an important Supreme Court of Canada copyright ruling released on Friday. Voltage Pictures sought subscriber information from Rogers Communications for the purposes of pursuing individual lawsuits. When Rogers advised that it wanted compensation of $100 per hour for the costs associated with fulfilling the request, Voltage responded that Internet providers could not pass along their costs since the notice-and-notice system already required them to identify subscribers and preserve the data without compensation. The particular incident may have involved only a few hundred dollars, but the broader principle had the potential to dramatically alter the Canadian approach. If Internet providers were required to disclose subscriber information without passing along the costs, Canadian courts faced the prospect of an avalanche of lawsuits and Internet providers might be dissuaded from carefully ensuring that the privacy of their subscribers was properly protected. The Supreme Court understood the broader implications of the case, ruling that Internet providers can pass along the specific costs associated with subscriber disclosures beyond those required for the notice-and-notice system. Indeed, the court recognized the importance of accurate data to safeguard against reputational harm and wrongful lawsuits. Some people may look at this and say that Rogers is selling out their own customer base. Others may look at this and say that this is just back room wrangling between ISPs and a major movie studio (potentially major record labels as well). Of course, these observations miss the broader implications of such a ruling. Remember that file-sharing legal threats tend to operate on the same business model as your typical scam. A scam, such as a telephone scam, operates on the idea of calling millions of phone numbers. While most will recognize it as a scam, some fall for it. If 1% of the scam falls victim, that could mean a couple hundred dollars per victim. If you make a million scam phone calls, 10,000 people may fall for it. At even $100 a pop, you have $1 million dollars and a viable model. In the case of file-sharing lawsuits, one could file a couple thousand notices demanding payment even though subscribers are under no obligation to settle. Not all notices operate like this, but some do. If you file 10,000 notices demanding $1,000 and 100 people freak out enough and pay the “settlements”, that’s $100,000 right there. Does it matter that these people are actually guilty of infringement? Not in the slightest. Now, suddenly, that expedition has a cost overhead of 50%. All that is left is a measly $50,000. Those carrying out those massive accusations have to pay employees to constantly sweep for IP addresses in the first place. On top of it all, you need to pay for equipment and maintenance. You also need to pay for lawyers because, what if one of those accused decided to fight back? What if that person who was randomly accused has deep pockets and wants to make a point? Suddenly, that $50,000 is looking increasingly like an exceedingly slim return once other costs are factored in. We’re not even sure we’ve factored in every cost involved either. Another thing to keep in mind is that businesses aren’t necessarily out there to make some altruistic point. Businesses are more typically out there to turn a profit. So, you are looking at a business model potentially going up in smoke real quickly. From a business model perspective, what is the point of dumping huge sums of money into something that will not turn a profit? At that point, that money would be better spent going towards a charity. Now, returning to what people are largely focusing on, not only is an IP address not indicative of guilt, but there is now also a major cost overhead on top of it all. At minimum, this puts a serious wrinkle in any plan to bring mass file-sharing lawsuits into Canada. If anything at all, all this shows that major corporate interests have been dealt a major blow with this ruling. With some semblance of accountability combined with a cost tied to enforcement, the future of mass litigation is looking increasingly questionable at this point in time.